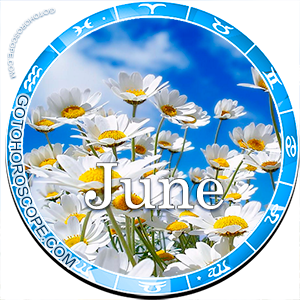 June 2016 Horoscope Aquarius, free Monthly Horoscope for June 2016 and Aquarius Astrology Forecast for the month ahead. 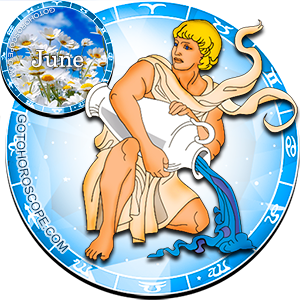 Representatives of the zodiac sign Aquarius in June of 2016 will face a lot of troubles as well as ambiguous and frankly difficult situations. However, in the first place, only the working direction of your life will be exposed to these tendencies, and secondly, we are not talking about any really complicated and completely unforeseen situations which you cannot prepare yourself for, but about the logical consequences that for witty and cautious people will hardly be surprising. Unfortunately, Mercury, which traditionally is your exaltation, will change the modality of its emanations and will try to do you some harm. Although the "heavenly huckster" will not currently possess sufficient strength, its influence can bring you some difficulties. On the other hand, Saturn, your ruler, will be on your side and will be backed up by the vehement Mars, in its normal position in charge of the "fall" of the sign Aquarius. The main thing now is not to doubt yourself and stay calm, even if something goes wrong. This life stage will be quite equivocal, in the sense that failure in one area will necessarily entail success in the other one. That is, everything will develop quite honestly and fairly, and besides, no one says that you won't have enough strength to withstand potential hardships. Alas, it is with high probability the working direction that Mercury will focus its negative emanations on in June of 2016. As has already been mentioned, the emanations of this planet will not be too strong and ambitious, but if you choose to ignore this danger they can easily turn into a real problem. Therefore, from the very first days of the month, try to concentrate on the most essential points. Do not overlook any single detail; summarize and organize all the available information. Now it is the key to successfully overcoming all pending obstacles. In addition, it would be nice to get support from your colleagues, no matter whether you work for yourself or for someone else. But be careful in choosing your allies! It is logical to remain friendly with everyone, but you should reveal your plans only to those who in your humble opinion really deserve it. Also, don't be too discouraged if you fail to sign a particularly important contract. Firstly, it will not be as important as you thought at first. And secondly, it wasn't some abstract circumstances but your actions that led to the following outcome. Only your own actions! Learn to take full responsibility, remember that in reality almost everything depends on you. However, fear and doubt often don't allow people to realize themselves, as they say, "in full." 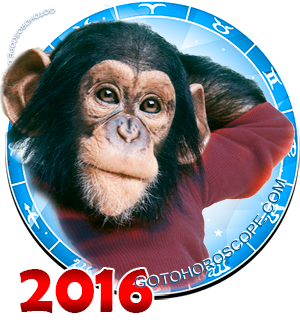 In the sensory-emotional sphere in June of 2016 the zodiac sign Aquarius will feel very confident. Even if during the previous stage something fell short of your target, be certain that now everything will change. Don't take the words of those who are dear to you too close to your heart. Now many of them (the people, not the words) will be dominated by passions, alas, not the most positive and life-affirming ones. Tame your aggressiveness and in extreme cases just keep quiet, especially if you fail to find clear-cut arguments. In the course of time people will realize that they were wrong and will definitely apologize to you. Your personal relationships will experience complete satisfaction of your desires and needs, no matter what it means in each particular case. The stars are on your side, so why not take advantage of it? Stay true to yourself and under no circumstances give in to stereotypes, even if you are really tempted to do so. Don't lower yourself to prejudices; follow your personal principles and values.